When longtime unscripted producers Rob Cohen and Christine Roth launched their boutique television development shingle Co-Conspiracy Entertainment in 2013, they never dreamed that it would also compel them to become publishers…again. “Getting back into publishing is about getting back to our roots.” says Cohen. Cohen and Roth published the L.A.-based literary magazine and coffeehouse staple Caffeine in the early and mid ’90’s. Though they published the likes of Charles Bukowski, Allen Ginsberg, Dave Alvin and Pam Ward, Caffeine also nurtured an entire generation of writers and poets. “We’ve always been about finding great stories and amazing characters. This is simply one more way we go about it,” says Roth. So why start a publishing company now? The way they see it, it’s about selectivity and spotting trends. With the advent of e-publishing, there’s a flood of fiction and non-fiction books on the market, with more published every hour. That’s created is a logjam of content; opportunities to discover great works are lost, timely stories are passed over and forgotten. And no one has the facilities to process all these properties for the purpose of optioning them. To answer that need, Roth and Cohen—a best-selling author whose own books have been optioned and turned into successful TV shows—used their producers’ savvy to identify those works and connect with authors whose books, whether new, self-published, or out-of-print, not only interested them but have film and TV potential. 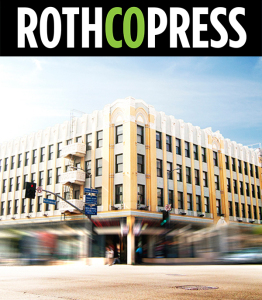 Rothco’s ambitious publication schedule includes new and reissued novels from best-selling author and cult hero Frank Lauria, best-selling comic romances from Jennifer Wiza (formerly Jennifer O’Connell), and originals from J.R. Mattison, Elizabyth Burtis and Criminal Minds technical advisor Jim Clemente. For more information, please email Rob Cohen Rob@Co-Conspiracy.tv or Christine Roth Christine@RothcoPress.com.